A roulade is a French word for something that is rolled and can refer to a thin piece of meat, poultry or fish that is spread with a filling and then rolled up, tied and cooked. A dessert roulade, often called a Swiss roll, on the other hand, is made with sponge cake and filled with whipped cream, pastry cream, ganache and sometimes fruit. This list is a selection of Top Eastern European Savory Roulade Recipes. 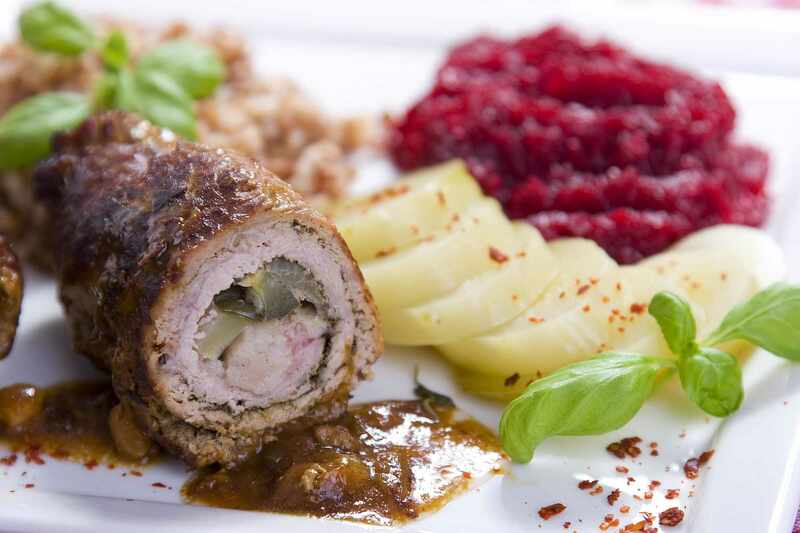 Polish beef roulade or zrazy (ZRAH-zih) is a common main course offering dating to 14th-century nobility. There are myriad varieties with just as many different fillings, including mushrooms, sauerkraut, herbs, breadcrumbs with horseradish, among others. This mushroom-stuffed cod fillet is a perfect example of modern Polish cuisine or Mo-Po that can be seen in higher-end restaurants throughout Poland. If cod isn't available, haddock will do, as long as it's at least 1-inch thick and 8 to 10 inches long. This recipe for Polish crab-stuffed salmon pinwheels or roulade is known as zrazy losos i krab. Crab and other shellfish are common along the Baltic Sea coast where this dish is enjoyed. While this is theoretically a cold (unbaked) appetizer, it is also considered a roulade. Thinly sliced Polish ham is rolled around pickles, asparagus spears, cheese slices or whatever your heart desires.